Melody Sim: What is love? I don’t know what the average age that people start thinking about love is – about what it is, who it will be and when it will come knocking on one’s door – but for me, it was something that I was (consciously) curious about since I was 9. As a little girl pre-maturely entering the “inquisitive teenager” phase, I endeavoured on the quest for answers to this lofty idea of love. I saw how married couples (ill-)treated each other; how they would argue over the slightest issue, and how they seemed perpetually irked by each other’s dispositions. “This, surely, cannot be love,” I thought to myself. Dismayed by the thought that (maybe - just maybe) love didn't exist, I sought refuge in virtual realities, escapism and temporal pleasures. There, I saw how young couples looked at each other with passion (which I later on realised was nothing but a manifestation of lust) burning in their eyes. I saw how desperate they were for each other, and how blinded they were to each other’s flaws. “Ah, that must be love,” I concluded. With my renewed faith, I met individuals whom I thought were "The One". Time and again, I was disheartened; every ounce of hope that I had was shattered. I fasted from my search for "The One". After a good four years of abstinence, the fast was finally drawn to a close. I decided to (once again) give love a shot, with someone whom I always had the soft spot for. The relationship turned out to be antipodal to what I had envisioned. At times, we seemed to be looking at our hand phones with greater passion than we did at each other. Rather than wanting to meet every single day, rather than being joined at the hip, we pursued our passions and hobbies independently. Instead of showering each other with an overflow of praises, and dizzying each other with words of incense, we were ever ready to voice out any discomfort. It is always tempting to look around at other relationships. Towards passionate young couples, I looked with covetousness at their burning-hot love. Towards loving old couples, I looked with envy at their deep-seated, unchallenged, love. "Why are we different?" Although never surfaced, the question always troubled, troubled and troubled me. 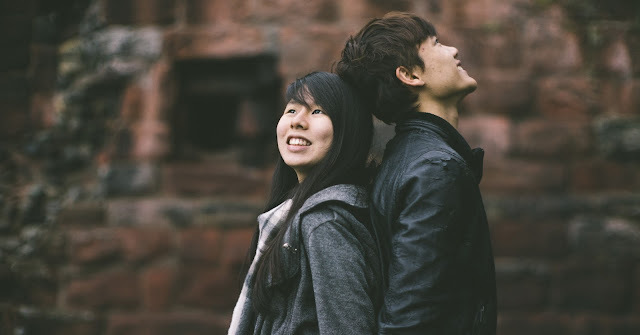 Yet, despite being aware that the relationship wasn't perfect, was neither the idyllic picture of a man and woman kissing in the rain, nor the storyline of the top-rated Korean drama that I was so caught up with, I didn't quit. And he, too, knowing that I'm not Mr. Rochester's dignified and passionate Jane Eyre, knowing that I'm not Edward Cullen's beautiful and attractive Isabella Swan, didn't quit. As we gradually stood the test of time, and as I started maturing in the relationship, I came to realise that what we had was in fact the epitome of love. I trashed my pre-conceived notions of love, the fallacy that it ought to be rainbows and butterflies, the folly of placing sky-scraping expectations on him, on us, and on love. This is why. Without having to be in constant contact, he made me feel loved. Without having to be in his embrace, he made me feel loved. Without having to look into his eyes, he made me feel loved. He showed me that love isn't gazing into my eye with overwhelming intensity but looking at me with tenderness and respect. He showed me that love isn't being unable to keep his hands off me but being faithful in making himself worthy for the marriage bed. He showed me that love isn't splurging on extravagant meals and designer bags but prudently saving, dollar by dollar, for a shared future. He showed me that love isn't overlooking all of my flaws but correcting me with patience, humility and gentleness. These are but a few of the many things that have culminated in the paradigm shift of my outlook on love. Doing the former would probably have made me euphoric - it would be an outright lie to say that I do not desire his intimate gaze, the touch of his skin, the vain presents and words that tingle my ears. It would also probably have required less effort on his part. Yet, he (always) chose the latter - actions of discipline, commitment and (true) love; actions of wisdom that are healthy for the relationship. As we grew closer and closer, I began to fully comprehend his intentions. Our beliefs, and our outlook in life, became more aligned, and finally, one. Now, I don't get jittery when he's not contactable for hours because I know that he has my trust. I don't get frustrated when he doesn't agree with me because I know that he understands me. I'm not insecure when he works with another girl because I know that he loves me. And it is, I believe, the same for him. I no longer believe that there is such a thing as "The One". Granted, there will always be people whom you are more inclined and attracted to, and people whom you, no matter how hard you try, cannot communicate with. However, in the realm of those whom you are attracted to and can effectively communicate with, it is all a matter of how much effort you are willing to put into making the relationship work. Never say that he or she isn't "The One" because there is no such thing as "The One". If a major setback is going to convince you that he or she isn't "The One", you are never going to find the love of your life because there isn't a relationship that exists without having disappointments and grievances. My utopian belief of "The One" was toxic to my relationship, burdening it with unrealistic expectations and unnecessary disappointments - I abandoned it. "Why are we different?" I am no longer troubled by the question, not because I have abandoned it but because I have found the answer. Of course we are different! Every couple has their unique set of challenges and misunderstandings. I was wrong - oh, deeply wrong - in assuming that my relationship was inferior, lacking and even problematic. I am now neither surprised to hear that the passionate young couple probably had a hot-headed argument just the day before, nor taken aback to learn about the tear-jerking, heart-breaking experiences that the loving old couple had gone through. The perfect love isn't one that is void of conflict, problems and unhappiness. The perfect love is precisely one that, despite being plagued by doubts and obstacles, chooses to persevere and fight against the grain. This is what love is. Don't give up on love. Do you know your 5 hair stresses?